Oyster mushrooms may sound more like something you'd find in the ocean than on land. Yet this edible fungus can be beneficial to the body and breaks down toxic chemicals. Oysters are one of the most versatile mushrooms. They are easy to cultivate and common all over the world. They are also very beautiful, coming in a broad spectrum of colors. Let's take a look at the different uses of this interesting mushroom. I'll start with some simple oyster facts and move on to their role in mycorestoration. I'll end with their human uses, both medicinal and culinary. Click here to share an oyster story with visitors to this page! The oyster mushroom is a saprotroph, meaning it feeds on dead and decaying matter (mainly wood). They are found on hardwoods throughout the world in the spring and fall. The caps usually range between 5 to 25 cm (2 to 10 inches) and are shaped like a fan or an oyster. The caps are rolled into a convex shape when young and will flatten out and turn up as the mushroom ages. They can be white, yellow, brown, tan, and even pink! They have a unique scent that is often described as sweet like anise or licorice (liquorice). The latin name Pleurotus ostreatus means "sideways oyster", referring to the oyster-like shape of the mushroom. There are a few closely related species that can be hard to distinguish from oysters. Thus it's helpful to bring someone knowledgeable when searching for them in the woods. The mycelia will kill and eat nematodes (small roundworms) and bacteria, making them one of the few carnivorous mushrooms. I believe the most fascinating use of these mushrooms is their growing role in mycorestoration. Mycorestoration is the process of using mushrooms to decrease pollution levels in a given area. Oyster mycelium is ravenous! It will eat through wood, paper, coffee grounds, and even petroleum products. Why will it decompose all these materials? These mushrooms are found on hardwoods. They secrete enzymes that break down the organic bonds in wood into smaller molecules. The carbon-hydrogen bonds in wood are similar to those found in oil and pesticides. Thus due to their love of wood, oysters are also efficient in breaking down the organic bonds in toxic chemicals. Imagine oil spills and pollution someday being decreased by mushrooms. This is the subject of numerous studies in polluted areas. One experiment is currently being performed by Matter of Trust, a non-profit group in San Francisco. In Nov07 the freighter Cosco Busan spilled 58,000 gallons of bunker fuel into San Francisco bay. Matter of Trust has partnered with famous mycologists to see if some of the spilled fuel can be removed by oyster mushrooms. Read about this fascinating ongoing experiment (and its political hurdles) here. 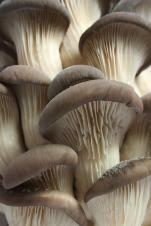 In addition to breaking down the organic bonds in oil, oyster mushrooms are also powerful absorbers of mercury. Their mycelium channels mercury from the ground up into the mushroom itself. Once the mushroom is picked and destroyed (obviously you wouldn't want to eat it! ), the mercury is removed from the environment. Heavy metal pollution is a serious problem all over the world. Just this morning (Aug08) I read an article about high mercury levels in the Great Salt Lake in Utah. What if someday we were able to remove toxic heavy metals like mercury from our soil and water by cultivating mushrooms? Is it possible? Can we remedy some of the terrible damage we've done to the environment through mushrooms? Plenty seem to think so. If mycorestoration is the wave of the future, oyster mushrooms will be leading the way! In addition to helping the environment, oyster mushrooms can help your body as well! So far they seem to have the most promising effect on cholesterol levels and cancer. Oysters naturally produce compounds called statins. Statin drugs reduce "bad cholesterol" (LDL) by stimulating receptors in the liver to clear the cholesterol from the body. Studies have shown a link between consuming Pleurotus ostreatus and a lowering of cholesterol levels, no doubt due to the statins they produce. Hopefully future research will reveal exactly how much to eat to get these effects. As for cancer, research shows a possible anti-tumor effect from polysaccharides in oysters. A polysaccharide is a complex carbohydrate made up of smaller sugar molecules. Specific polysaccharides, known as beta-D-glucans, are suspected to stimulate the immune system to fight cancer.The beta-D-glucan isolated from oyster mushrooms is called pleuran. Studies are ongoing into the effects of pleuran for cancer treatment. Eventually I'd like to link to a legitimate human trial, as all those I've found so far have used laboratory animals. Oyster mushrooms are also a popular edible. They have a nutty, subtle flavor that goes well in soups, stews, and sauces. Fortunately Pleurotus ostreatus is one of the easiest species to cultivate. If you're not into growing your own mushrooms, you can find them in the woods or your local grocery store (where you may see wildlife of a different sort). If you do plan on finding them in the forest be sure to look on hardwoods (oak, maple, aspen, elm, etc..) anytime from spring to fall. Don't forget to look up as well. I've found them fruiting in a vertical line high up trees as well as at eye level. As always, be sure you know what you've picked or double check with someone who does. Oysters are commonly home to beetles and other bugs so they'll need to be wiped and cleaned once you bring them home. They dry and reconstitute very well so don't hesitate to dry them and save some for later! Use caution if trying them for the first time. Some people are allergic to their spores while others may experience an upset stomach. Try a small amount first to see how your body reacts. Although they go well in many dishes, the most common way to cook oysters is a simple saute or stir fry. Brown them in olive oil with herbs and spices of your choice. And don't forget the garlic! What's Your Favorite Oyster Mushroom Experience? Want to dazzle us with the photos of the oyster mushrooms that you found? Have a favorite recipe? 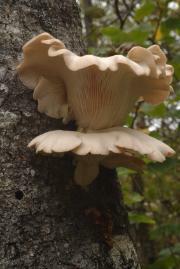 Click on the links below to see some great photos and tales about oyster mushrooms. They were all written by other visitors to this page.